UC San Diego is committed to conserving energy in cooperation with statewide load-reduction initiatives and UC standards. The campus generates about 85% of its own electricity using an ultra-clean and efficient cogeneration plant, the world’s largest commercial fuel cell and solar panels. The campus operates a 30-megawatt natural-gas-fired combined heat and power system that provides 85% of the campus’s annual electricity needs. The plant has received an Environmental Protection Agency Energy Star CHP Award for its high efficiency and low emissions. It helps the campus save $8 million per year in energy costs. Cogeneration uses one fuel source (natural gas) to produce two forms of energy (electricity and heat). State-of–the-art gas turbines equipped with pollution controls are 45-50% more efficient than conventional natural gas power plants and produce 75% fewer emissions. UC San Diego has built one of the world’s the most advanced microgrids, which is key to creating a carbon neutral campus. The microgrid provides a flexible, resilient, reliable, secure energy distribution system that generates more than 85% of the electricity used on campus annually. Power is provided from several sources the campus’ 30-megawatt cogeneration plant, 2.8-megawatt renewable energy fuel cell, and 2.4 megawatts of solar arrays. The campus’ 2.4-megawatt solar network includes an array of rooftop, carport and ground mounted systems, including several integrated with advanced energy systems. The campus continually seeks opportunities to expand our solar infrastructure. Our 2.8-megawatt fuel cell is the largest on any college campus. It provides about 7% of UC San Diego’s total energy needs, or the equivalent of powering 2,800 homes. The fuel cell uses waste methane gas from the Point Loma Wastewater Treatment Plant to generate combustion-free electricity for the campus. In addition to electricity, a 300-ton absorption chiller captures waste heat from the fuel cell to produce chilled water that is stored in the nearby Thermal Energy Storage system. 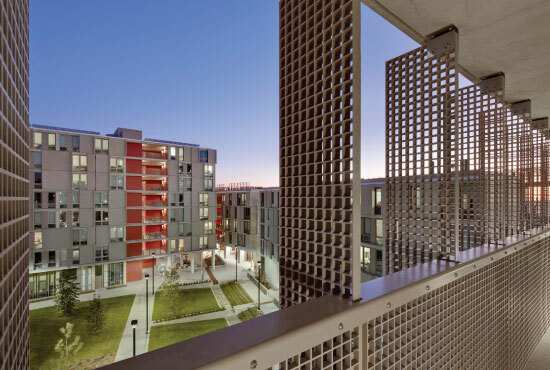 A 300-kilowatt solar water-heating system installed at North Campus Housing is one of the largest solar-thermal projects at a North American university. The campus plans to complete more than $50 million in energy retrofits over the next five years. All new construction projects must meet Leadership in Energy & Environmental Design Silver certification or better. This ensures that new campus construction and major renovation projects maximize energy and water efficiency, help reduce carbon emissions and improve indoor environmental quality. To support its ongoing clean energy program, the campus has used a variety of financing mechanisms, including third-party financed Power-Purchase Agreements, Federal Clean Renewable Energy Bonds, and state and federal grants and incentives. Under a power-purchase agreement, the university enters into a contract with a third party energy provider that agrees to own, operate and maintain a renewable energy system on campus. In return, the university pays the energy provider a negotiated rate for the renewable electricity generated. In 2008, UC San Diego signed a power-purchase agreement with Solar Power Partners to develop a 1.2-megawatt photovoltaic system on campus, which allowed the university to take advantage of solar power without cash up front. The campus’s 2.8-megawatt fuel-cell project utilized a similar agreement. Under the Internal Revenue Service’s Clean Renewable Energy Bond program, UC San Diego was able to access $15 million in low-cost loans to fund the installation of 2 megawatts of solar power at on- and off-campus sites. Over the past 10 years, UC San Diego has received more than $30 million in state incentives and rebates — like the California Solar Initiative, Self-Generation Incentive Program and the UC/CSU Energy Partnership Program — that have helped reduce the cost of providing clean energy alternatives. UC San Diego’s ongoing clean energy and Microgrid-related research activities have helped to secure numerous federal and state energy-program grants. For example, the campus and its partner, Nuuve, recently received a $4.2 million grant from the California Energy Commission to demonstrate how “Vehicle to Grid” technology, where electric vehicles feed stored energy back into the grid, can work on a large scale. This grant was possible because UC San Diego’s Microgrid allows the flexibility to incorporate new and innovative clean energy solutions into a real-world operational environment. Most recently, in partnership with UC San Diego’s Center for Energy Research and ESS, a demonstration 40 kilowatt/400 kilowatt “all-iron flow battery” was installed on one of the three test sites located at the east campus Energy Research Park.